Can a game make you cry? 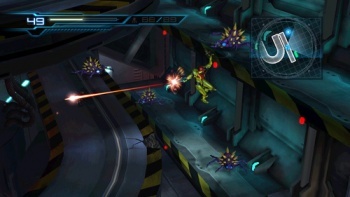 If the game is Metroid: Other M, and you're series co-creator Yoshio Sakamoto, the answer is yes. While each individual game has its own specific nuances, the story in the Metroid series has always been something along the lines of: "You are Samus Aran, you are on a strange planet. Go blow some space pirates up and get item upgrades. Have fun!" Team Ninja's upcoming Metroid: Other M, on the other hand, is clearly aiming for a more story-driven experience - with over two hours of cutscenes that are compiled into one long watchable movie upon completion of the game. It also features at least one scene that made series co-creator Yoshio Sakamoto well up with tears, according to the latest installment of "Iwata Asks." Speaking with Nintendo's big boss Satoru Iwata, the game's cutscene director Ryuzi Kitaura discussed how Sakamoto would come watch him shoot live-action motion capture footage for the in-game cinematics. Now, given that it was mere motion capture, it was a rather austere process: "[Since] these were temporary cinematics, we were asking him to shoot things like Samus in tights, or polystyrene creatures, and there was no set to speak of." And yet, even this bare minimum was enough to inspire a bit of emotion. "[Sakamoto] stood close to me, checking the monitors. When we'd shoot a particularly moving scene, I'd ask him 'How was that, Sakamoto-san? ', but he'd be completely silent - again ... I was really worried, thinking 'Oh no, he doesn't like it...', but then when I peeked at his face, his eyes were full of tears." Sounds moving, right? On the other hand, Kitaura jokingly offered another explanation for the tears: "Well, the cinematic did show Samus in tights."